Let’s say you love the endearing looks of the reincarnated Beetle, but you yearn for the performance of the Golf GTI. For 2014, VW has slipped the drive train and chassis of the outgoing GTI underneath the architecture of the Beetle, so you can look cute but go like a stink bug. The new code name for this potent combo is “R-Line,” a term formerly used to designate racing derived upgrades like flat bottom steering wheels and ribbed aluminum pedals. Now, VW has eliminated the “Turbo Beetle” name from its model range, in favor of the designation “Beetle R-Line.” When you lay down $32,030 for one of these, you get a 200hp GTI dressed in Bug clothing. The combination is a delight to drive. VW stylists have revised the front and aft appearance of the Beetle R-Line by substituting stealthy looking new fascia and tail panels. The front splitter is now more angular, and the rear under tray features new diffusers. There’s also a massive back wing lurking just below the rear window, plus a bevy of R-Line identifiers on each side of the nose, at the base of the racy flat bottom steering wheel, and on both threshold kick plates. 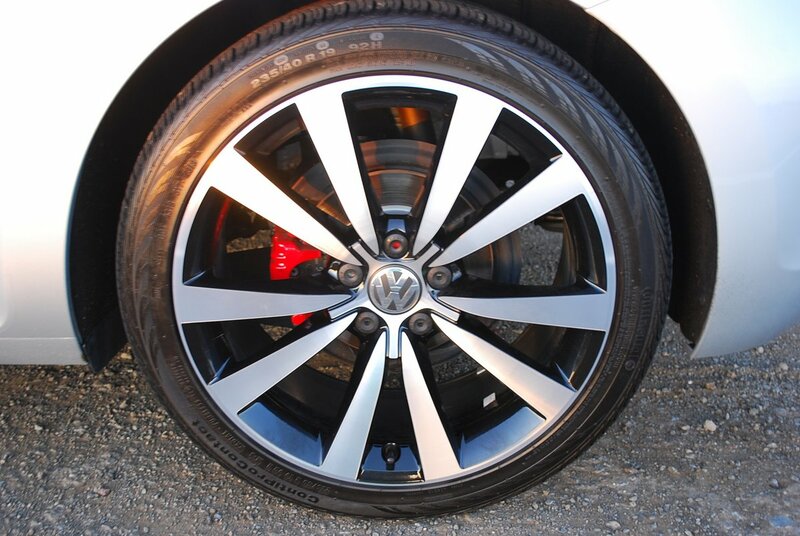 Visually engaging 10-spoke alloy rims hide cheeky red disc brake calipers. Gaping flared fender wells barely contain beefy 235/40R19 Continental ContiProContact tires at each corner. One look at the svelte Beetle R-Line is enough to remind you that VW runs a very competitive year long race series for these cars in Germany. Yet once you’re seated inside the tidy cabin, it’s easy to slip into calm and casual motoring thanks to the DSG transmission’s fully automated assistance. Left to its own devices, the DSG 6-speed will seek out the highest possible gear and thus help you attain 24MPG in town driving and 26MPG overall fuel economy. Of course, you can always slot the DSG stick into its manual gate and make your own decisions about gear choice. Shifts in both directions are quick and crisp. VW provides a pair of tiny flippers behind the steering wheel to aid your gear changing, but I found it much more rewarding to knock the floor stick forward for down changes and back toward me for up shifts. The turbo motor is so eager to spool up its 207 lb.-ft. of torque that it’s really easy to leave rubber when mashing the gas in the lower gears. 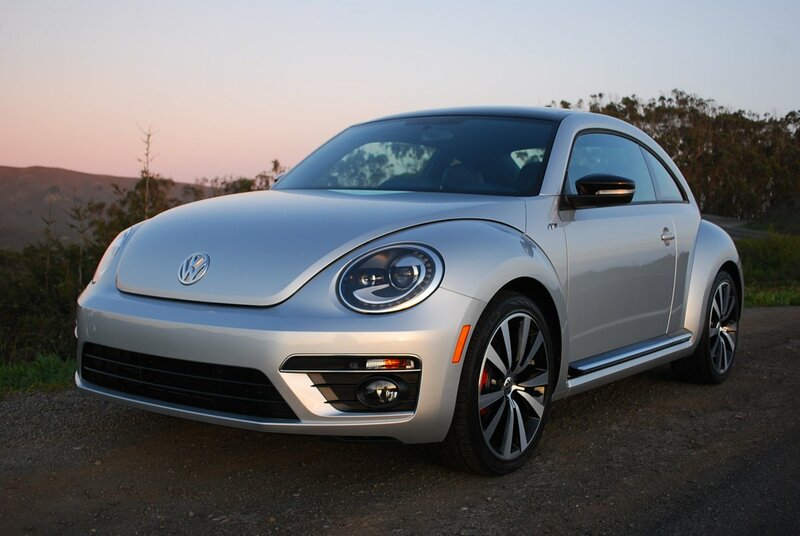 When you do so, the front end of this Beetle lifts like a motor boat, steering response diminishes as the front tires lose adhesion, and the R-Line torque steers slightly as you struggle with the sudden surge of power. Although this VW may share looks with lesser Beetles, it’s really an adrenalin-inducing hot rod that’s an absolute blast to drive. The “Sport Suspension,” which is standard issue on R-Line Beetles, controls body lean in cornering, while still maintaining enough bump compliance to keep you comfortable. 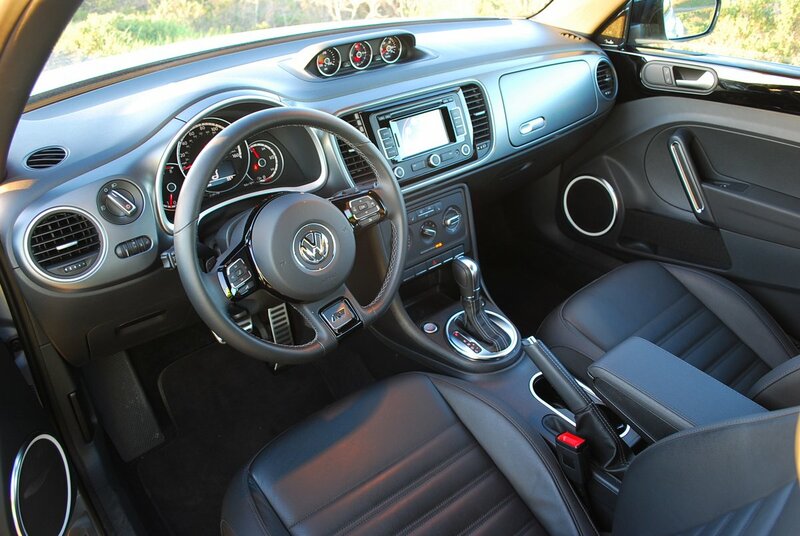 Such a compromise is a black art, and VW is well versed in the intricacies of the equation. Given its low roofline and substantial tail spoiler, you might expect vision from the driver’s seat to be problematic. Such is not the case, since the wings lies flat enough to be invisible, and the view through the rear windows and excellent mirrors is good enough to allow freeway lane changes without hesitation. You could improve the direct rear sightline by removing the headrests from the rear seats, or folding them down until needed. While adequate for kids, the rear seats present painful entry, egress and seating prospects for adults. 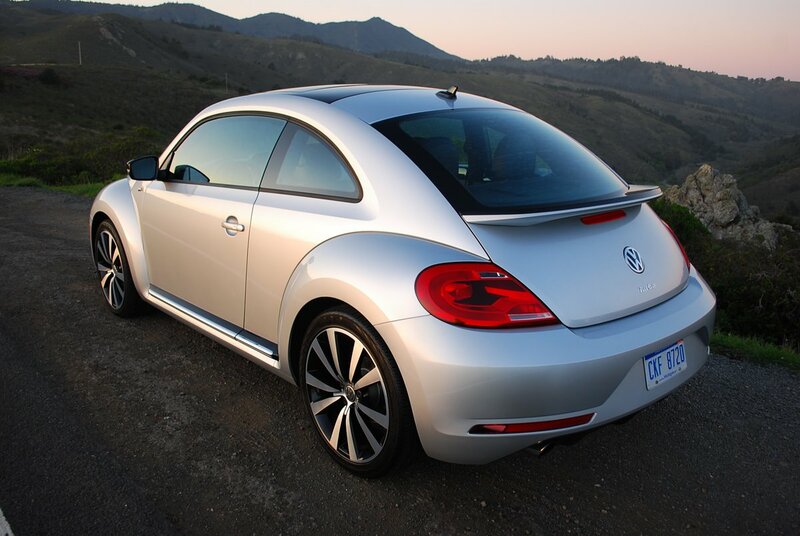 When you do fold the rear seats, the Beetle affords a surprising amount of storage space. In fact, a trip to Home Depot revealed that the interior dimension between the rear fender wells allows a 32 inch wide sheet of 48 inch long material to be comfortably accommodated. If not for the 3 inch intrusion of the Fender sub woofer in the trunk, you could slip a 3 foot wide sheet into the trunk flat. The R-Line Beetle is very much the stealth bomber of VW’s flight group. It’s quietly handsome without being ostentatious. To looks at it, you’d never anticipate the level of performance it’s capable of doling out. Yet it’s one of the fastest cars on the open road, with enough performance reserve to make you smile broadly at the prospect of an early Sunday morning jaunt on an empty, twisty back road.